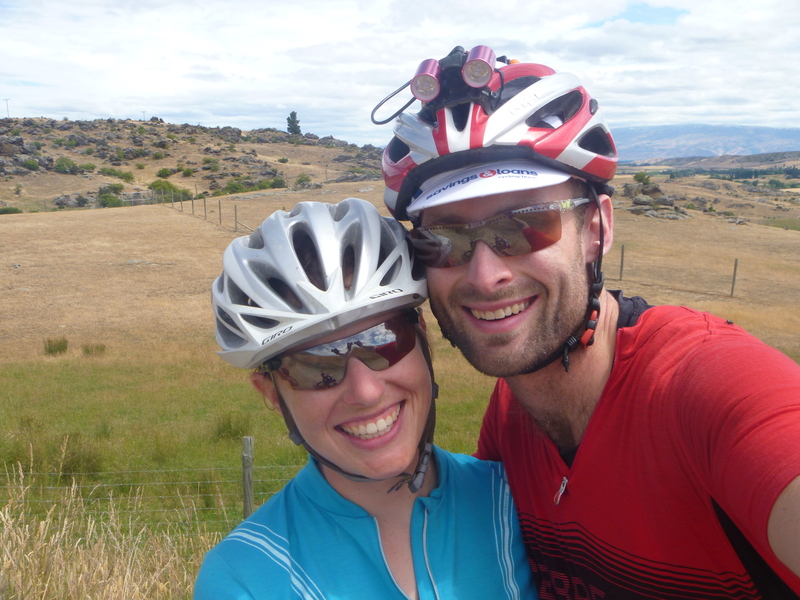 NZ: Love on the rails… the rail trail that is! It has been well over a month since we got home from NZ and I must confess the whole blog writing thing just hasn’t appealed. I got through day one of our bikepacking trip and hit a writing brick wall. Now though, there are lots of very exciting adventures in the pipeline so I thought it is time to get this written and get on with things! Where I left off last time we had just completed day one and had found a nice camp next to the river near Arrowtown. We got up nice and early, feeling a bit guilty as we rode past all the ‘no wild camping’ sign. 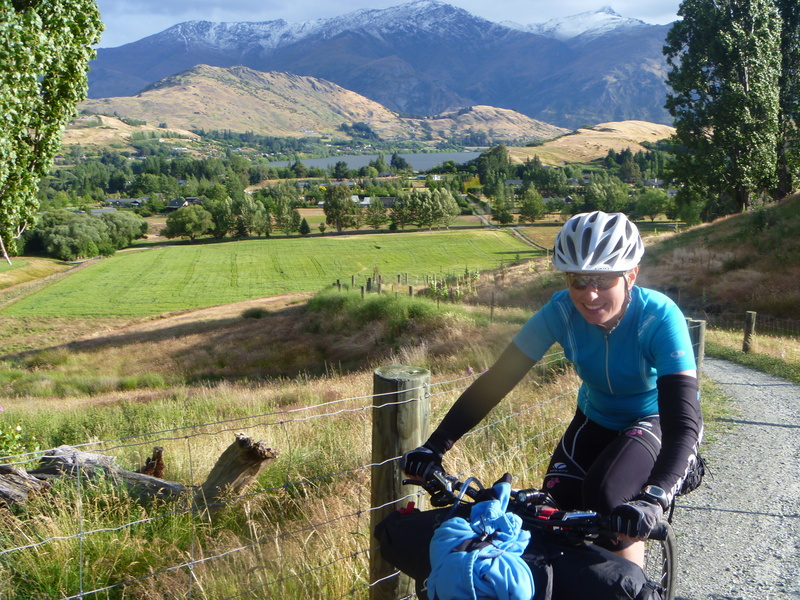 We rejoined the great Queenstown trail we had been following and headed out of town towards Cromwell. After some amazing gorges with spectacular swing bridges that took my breath away, we snaked around next to the Kawarau River on the bitumen for quite some time. We stopped to have a look at the Roaring Meg lower hydro power station. On the other side of the road a small dirt track starts to ascend up into the clouds: The Cardrona-Roaring Meg pack track which is used in the Great Southern Brevet course. We hope to be coming down that very track next year! 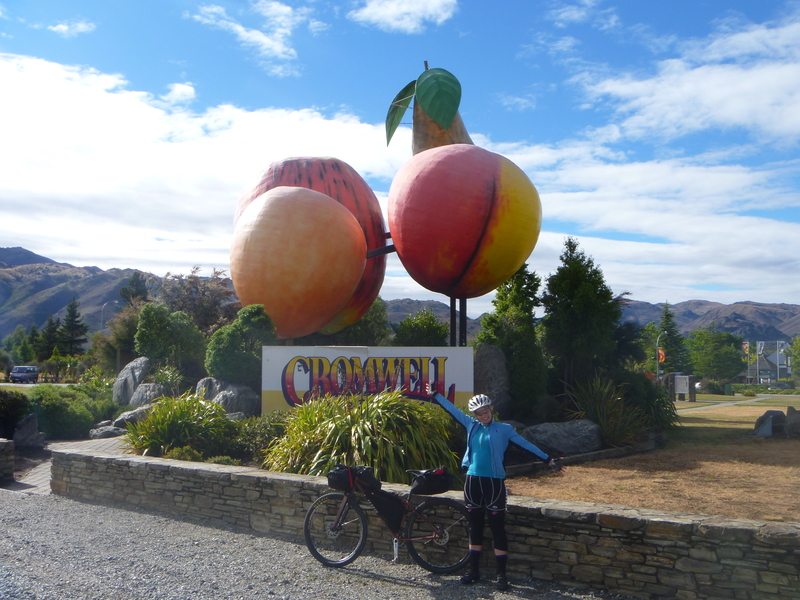 We cruised into Cromwell for a very nice late breakfast, coffee and obligatory fresh fruit from the roadside stall. From Cromwell we pounded out some more bitumen km’s before descending down to Clyde. 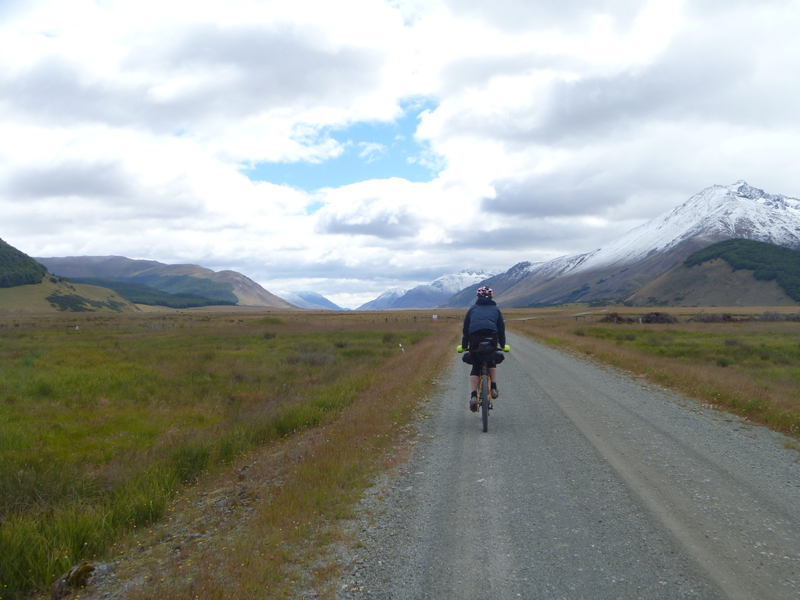 We asked around and were advised to ride the ‘river track’ into Alexandra instead of the start of the Central Otago Rail Trail as it was meant to be pretty fun. Turned out to be a wicked, windy and flowing dirt track next to the river. Needless to say, on our first real dirt for the day, much ‘woooooping’ was done! Eventually the river track brought us out at Alexandra where we refueled and readied ourselves for the Central Otago Rail Trail. We didn’t particularly have a plan as to where we would get to for the day, just see how we felt as the day went by. The Central Otago region has sweeping views of vast open plains and treeless hills; famous gold-mining country. It was hot, the sun was out and there was nowhere to hide. We started stripping layers off as the hours went by, climbing up a slight but ever-constant gradient towards Lauder. As we approached the top of a one hill, Seb asked if we should stop at the seat coming up and swap out of our SealSkinz socks ’cause our feet were sweltering! Oblivious to what was unfolding in front of my eyes, I stopped, changed socks and was ready to move on. Seb, on the other hand, had unpacked what looked to be his entire bag onto the ground, very unusual for his usually quick and punctual stops. I’ll spare you the mushy details but there was a seat with an inscribed Irish blessing, a killer view and a romantic proposal! Couldn’t have been more perfect for two sweaty cyclists in love! Unfortunately, there wasn’t a soul around for me to tell and we still had a fair bit to ride if we wanted to stay in Ranfurly. We got to go through some more pretty spectacular scenery plus over another huge bridge and through two old train tunnels! I got to test my KLite dynamo light in one of the longer tunnels which was great, good to get some use even if only for 1km! KLite dynamo light on and into the tunnel we go! 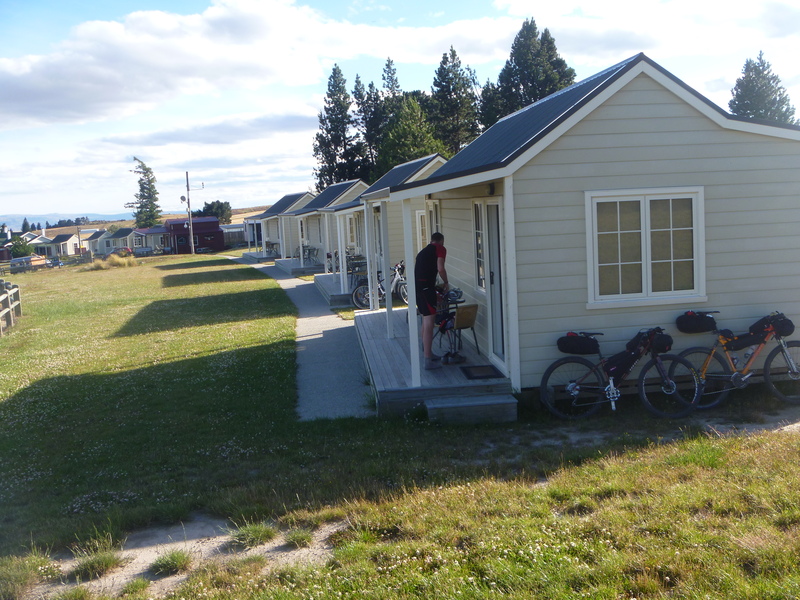 We made it as far as Wedderburn where we stumbled across some very cute rail trail cottages made to accommodate the normal folk who don’t carry their own tents…. We were starving, sun burnt, engaged and there was a king bed and free breakfast! No way we were passing that one up! Turned out to be quite lucky as that night I suffered from very bad heat stroke; shaking, hot cold feverish and feeling very unwell. Was very glad to have a cool shower and some normality to get me back under control. Wedderburn cyclist accommodation. La-di-da fancy (compared to the tent)! A long and eventful day in the saddle. Very obvious niggle starting to occur in my left hand: feeling weak and a bit tingly. 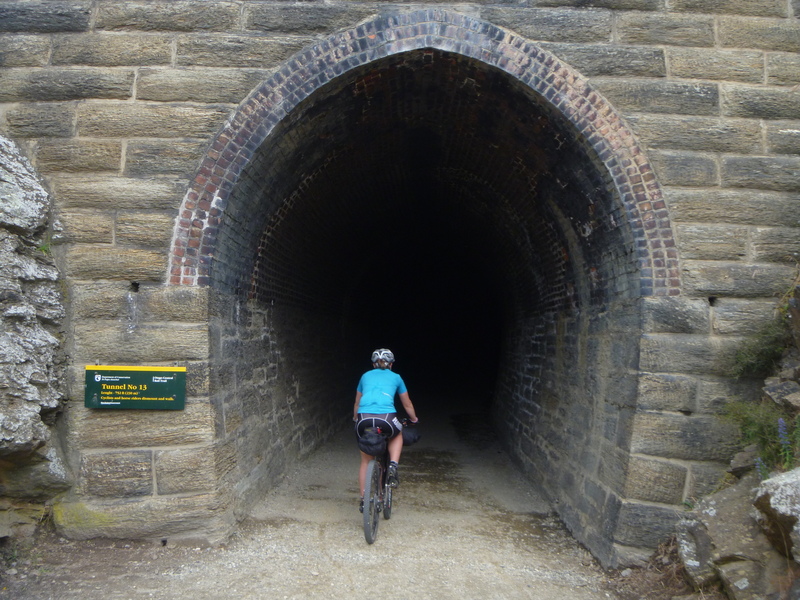 Tomorrow we would leave the rail trail and head through Naseby and over Danseys Pass. 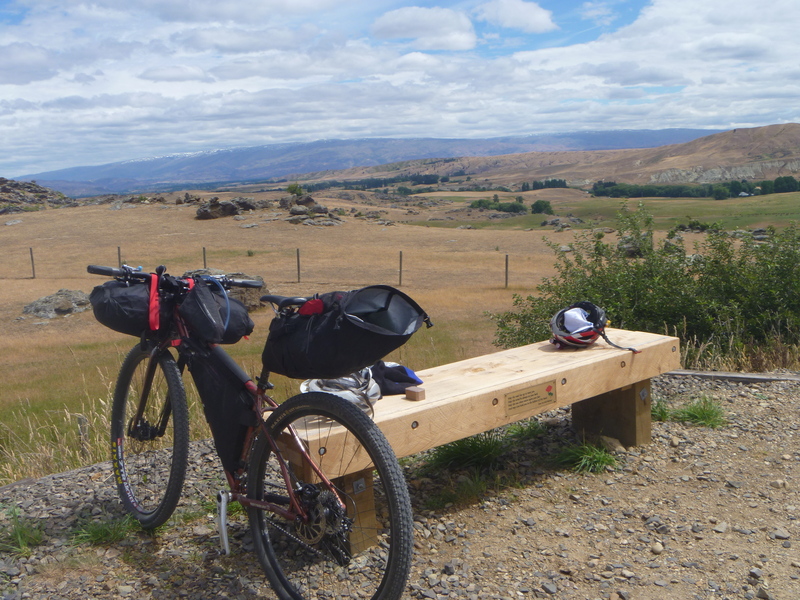 This entry was posted in BikingBethany and tagged bikepacking, epic rides, Great Southern Brevet, new zealand, otago central rail trail on February 25, 2013 by bethany. 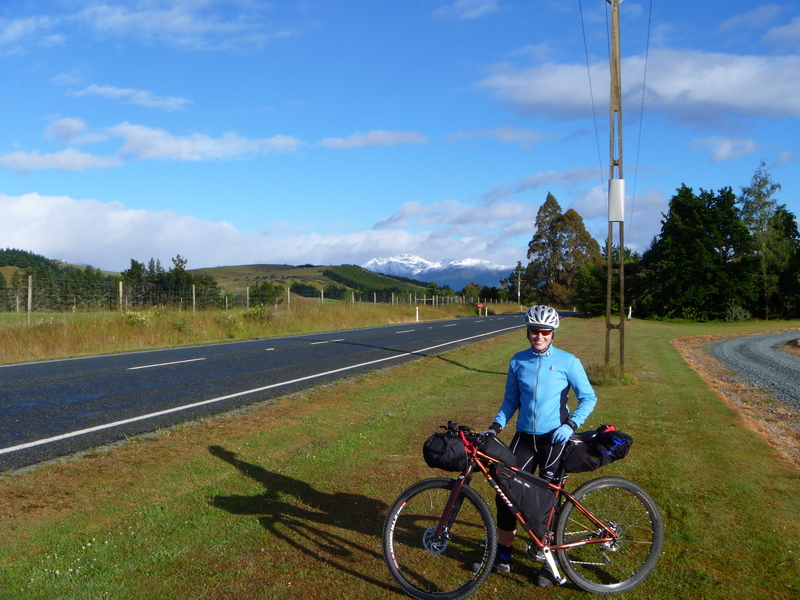 Our New Zealand bikepacking adventure started in Te Anau, a small town on the west coast of the Southern Island. After surviving days of treacherous rain while hiking the Milford Track, we were hoping the sun would be shining. We woke up to views of snow on the hills and a very crisp breeze blowing, but it was sunny and there was no rain so we were happy! Already a day behind plans because of the extra night we had to spend on the hike, we were just going with the flow and didn’t have set-in-stone plans for where we would end up that night. So easy to do when you are carrying everything you need on your bike! 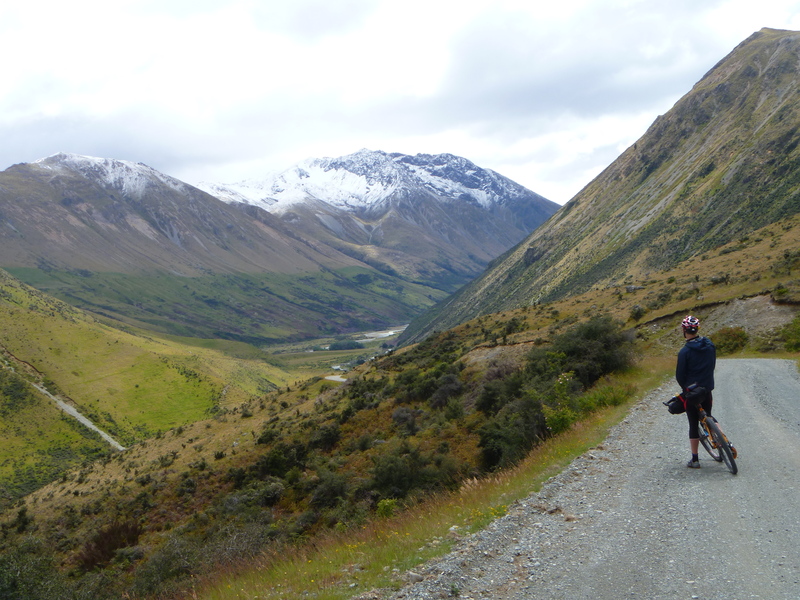 Our route took us on the main bitumen road out of town towards Queenstown, but we took a sneaky left turn which headed us onto the dirt and towards Mavora Lakes. The mountains around us were impressive and made the backdrop on the horizon such a nice distraction. We passed Jane Peak (2022m), a popular tramping and climbing and mountain, covered in snow from the fresh dump over night. We rode for about 70km up the valley against one of those gradients which you never really see, but by the end can definitely feel it in your legs. The ever-so-slight-upwards grind combined with loose gravel roads and icy cold wind off the snowy peaks made for a slog of a morning. I was really struggling with a head cold I got while hiking and was crawling along at caterpillar pace. My remedy: CookieTime! These things are the yummiest cookies I have tasted and the best bit is that they are about as big as your whole hand. We bought them in bulk from a girl at the supermarket who was as crazy- excited about them as we were. I think this day I munched at least three of them. 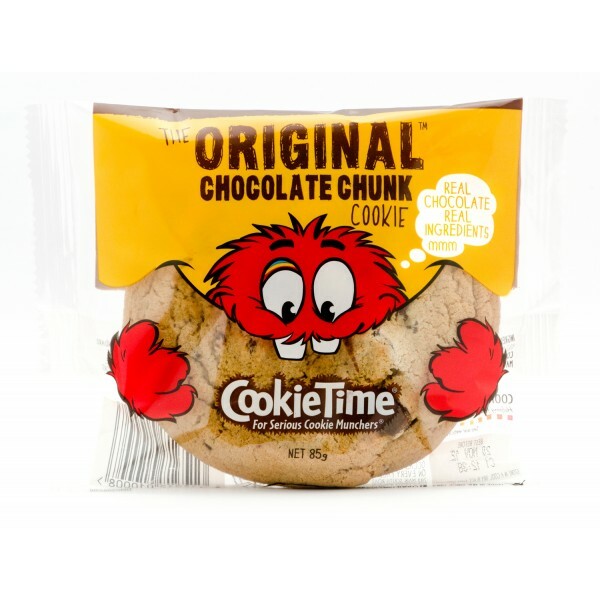 CookieTime – Nom nom nom! After a quick detour to check out South Majora Lake, we returned to the road, climbed a little hill and were over into another hugely vast valley. The downhill was short lived however and we were back to battling the slow gradient and odd temperature changes from freezing to sunny and back to freezing again! This part of the road was far less travelled as it was a dead end for cars. The ferry at the end takes you across to Queenstown, but only by foot, not car. The only people we really saw were the same farmers, driving up and down between their properties doing routine looking stuff. One ute had a little wagon on the back and was pulling into all the farms collecting dead sheep. They were tossed in upside down, this way and that, the poor things bouncing around from the corrugations. I think we saw the same dead sheep about 10 times that day. We were on a bit of a schedule as we needed to make it to the ferry in order to get across to Queenstown, but my snail pace meant that we had already missed the first of the only two trips for the afternoon. So, in the nicest way possible, Seb told me to get those pedals cranking over a bit more of a lively fashion! 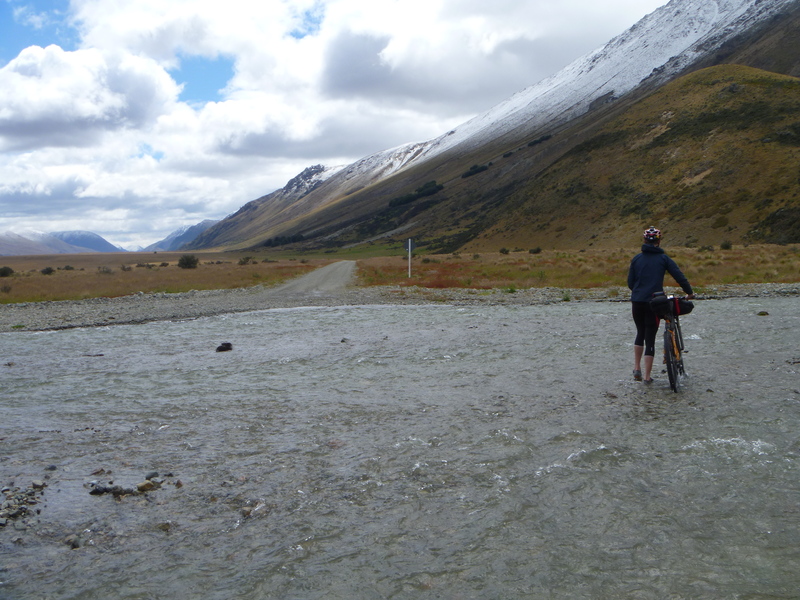 The road became a little more undulating with some more noticeable ups and downs but what we didn’t expect was at the bottom of one of the downs: a freezing water crossing with no bridge and far too wide and raging to ride across. With our shoes off, we waded through, and I learned that what I had previously called cold feet was far from this current numbness. and then after some traumatic experiences with heard of cows on the road, we made it to the ferry! The TSS Earnslaw is the last operational coal-fired steamer in the southern hemisphere. It runs daily trip between Queenstown and Walter Peak Station Lake Wakatipu, saving tourists a 300km long drive around. We enjoyed a venison pie while watching men shovel filthy coal into the ships fiery boilers for the 90min journey across. Once at Queenstown we met my brother and his girlfriend and all made tracks for Fergburger, the most popular burger joint I have ever heard about! The line was epic and we waited 30 mins before we could munch on our burgers, but woahhhh they were worth it. Melted blue cheese and garlic aioli, yes please! After coffee we had to decide which way we would go. We originally had planned to head south towards Kingston and then up over the range but everything was covered in snow and snail pace Beth had put us quite behind schedule. 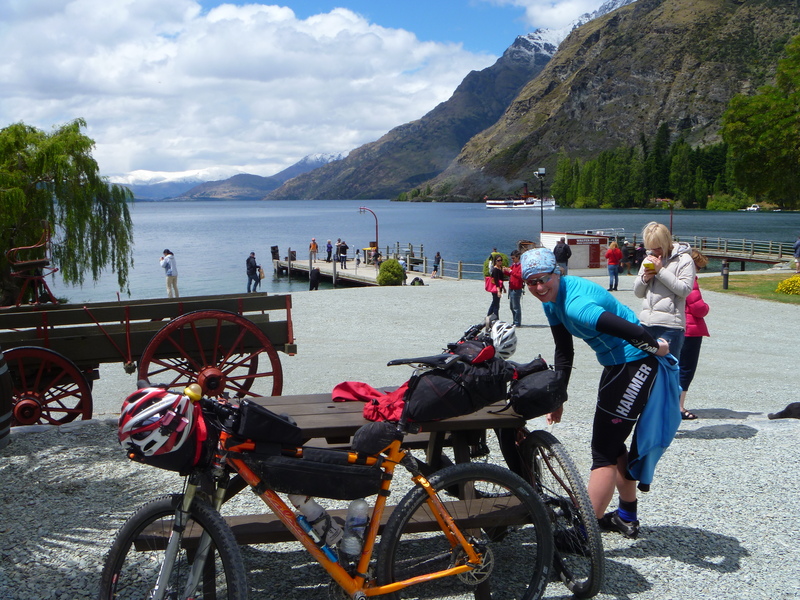 We could have stayed somewhere in Queenstown but our bikepacking adventure had already turned into a lazy lunch ride. We decided to change tactics and headed towards Arrowtown. 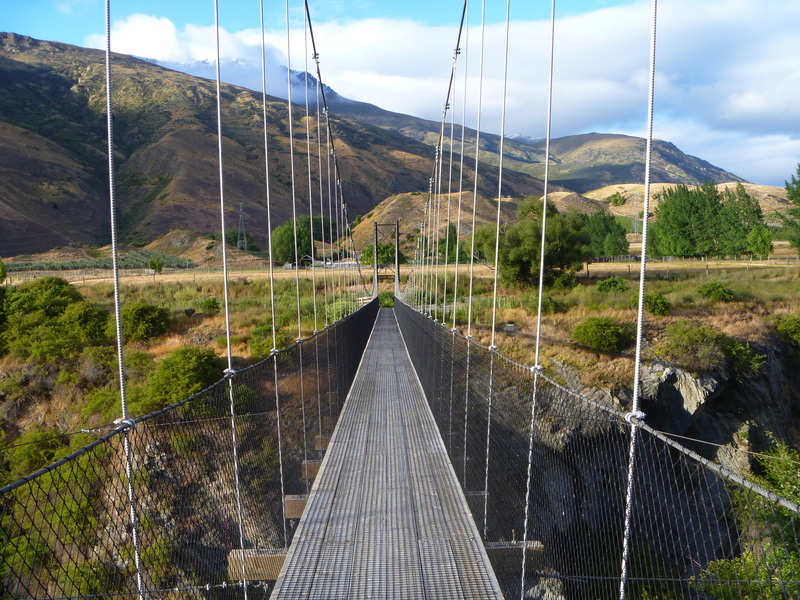 We joined up with the Queenstown Trail which is a signposted and totally awesome trail and only opened in October 2012. We felt like practically the first ones to ride it! It would be amazing to see more dedicated cycling tracks like this in Australia! The trail took us across some huge bridges while we wound our way through the historic gold mining district. Eventually we made it to Arrowtown and by chance stumbled across a mountain biker who advised us of a good spot for some ‘free camping’. Generally free camping is allowed in NZ, but as you get closer to towns they have big ‘NO FREE CAMPING’ signs, so we snuck quietly into the bush across the river on the other side of town. Perfect. After what was a long, adventure filled and exhausting day for sick Beth, I was glad to finally be able to rest. This was our trip to test out all the new gear we had been procuring over the last year, so out our new Revelate Designs Sweet Roll we pulled our sleeping gear and fell straight to sleep our cozy new Western Mountaineering sleeping bags in our new Tarptent tent. We were not sure what Day 2 would bring, it would be decided based on how I felt in the morning. The route had already changed so much due to the snow that we were open to trying what ever took our fancy and that made it exciting! 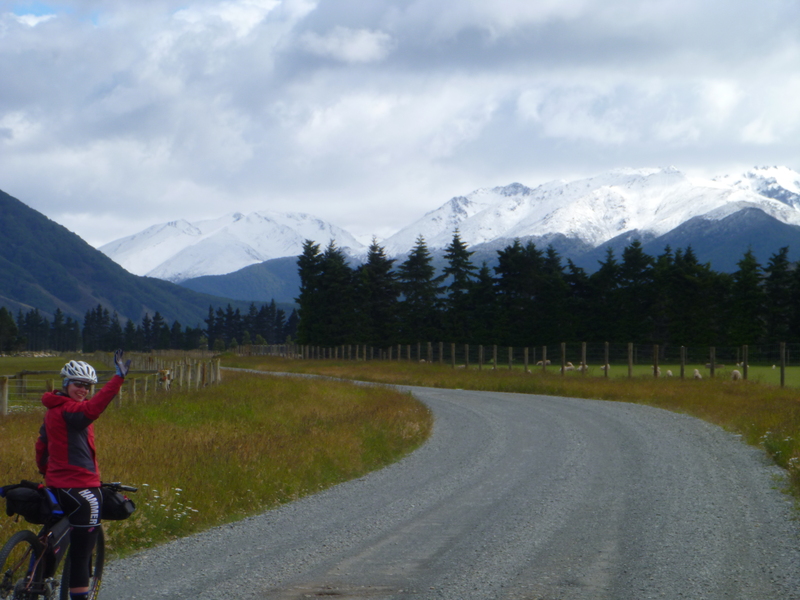 This entry was posted in BikingBethany and tagged bikepacking, epic rides, Great Southern Brevet, new zealand on February 4, 2013 by bethany.